‘Tis the season of giving! ‘Tis also the season of our approximate two-year anniversary, and also the season of our 400th twitter follower. For all these reasons, we thought it’d be a great time to… that’s right, you guessed it… give away a free board game! And what better game to give away than one of the games we’ve been most excited about this year, Donald X’s INFILTRATION (see our review here). Infiltration, a push-your-luck game of breaking in and stealing from a sinister megacorporation’s headquarters set in the Android universe, is quite a blast to play. With its well-formulated structure, fast-paced play, and risk/reward tension all set to a delightful backdrop, I have the feeling this game will stay in my collection for a very long time. And now you’re getting the chance to add it to yours, for free! You only need to do one of the above three to enter, but each additional thing you do gains you an additional entry. The contest officially ends at 11:59 p.m. CST on Friday, November 30th. At that time we will gather all of the entries and put them in a big numbered list and then choose a random number. We will then contact winner, and they’ll have three days to respond. If they don’t respond to claim their prize, we will pick a new winner, rinse and repeat, until we find someone to claim the prize. 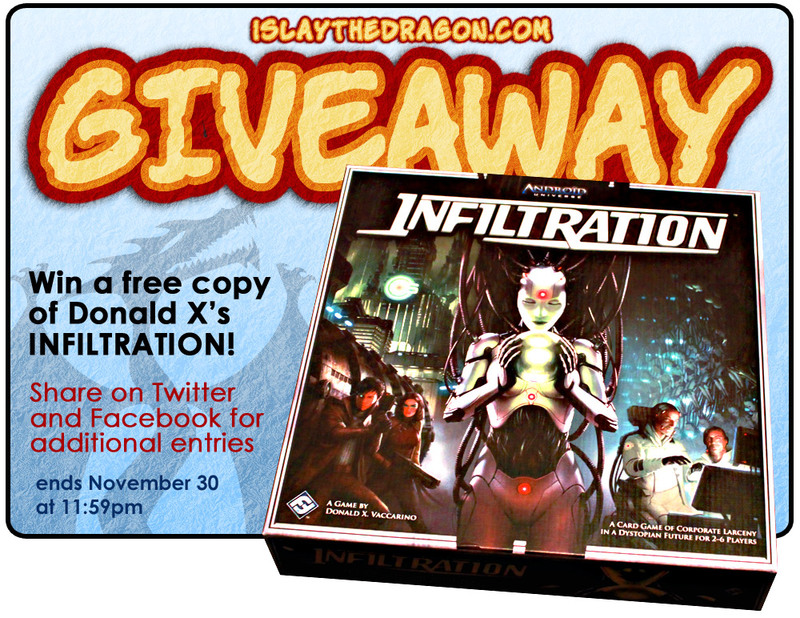 This contest is in no way sponsored by Fantasy Flight Games (we are supplying the prize ourselves) or anyone associated with Infiltration (we chose this prize because we love Infiltration), so you will receive as soon as we can get it shipped to you. We will do our best to ship your prize in a timely manner, subject to availability. The contest will end on November 30 at 11:59pm (central time) We will contact winners the following day using their method of entry (DM for Twitter, Facebook message for Facebook, e-mail for comments on FDQ—therefore, use a real name and e-mail address; it will only be used for this contest, promise). If the winner does not respond within three days, we will choose a new eligible winner, and so on, until someone claims the prize. This contest is open to anyone with an address in the continental United States, except for our family members (sorry, Mom!). (International folks: if you can find a continental US address willing to accept your prize, we’ll ship it there, and they can handle the next leg of the journey to you.) We will have the prize ordered within 24 hours after the winner responds to claim their prize, again subject to availability. The winner will be chosen using random.org. We reserve the right to cancel the contest, modify the rules, or disqualify any entrants if there appears to be any tomfoolery or loopholing—please, follow the spirit of a good-natured giveaway contest. Good luck, and happy slaying! Can I really be the first one to enter by leaving a comment here? Well, in any case, I played this at my FLGS a couple of weeks ago with my normal gaming group (6 of us) and we had a really good time! So good, that one of my friends bought a copy. Sadly, he hasn’t brought it to game night since, so I hope I will be fortunate enough to win my own copy here so I can be the cool kid with the game everyone wants to play! Thanks for running the contest guys. I had no idea Donald X had made a new game! I obviously haven’t been keeping up with things very well! I’d totally love to win it… awesome contest! Lissa, Donald X actually has several non-Dominion games. Kingdom Builder and Nefarious are also available, we haven’t had a chance to review them though. Gauntlet of Fools is another Donald X game that is releasing at the end of November and we should have a review of it around that time as well! This is one I’ve been interested in trying out. I’ve wanted Infiltration for a while now! After playing a couple of rousing games of Gauntlet of Fools last night, I’d be hard pressed not to enter a contest that could possibly land me a free copy of another Donald X game! I’m interested to see what it does with the Android world. I have most of the other games that Donald X. has made, and really enjoy Netrunner, so I’d love to give this one a shot. Netrunner was a great game. I’ve been keeping my ear to the ground regarding this game, but I just haven’t pulled the trigger yet. Free is a good start! Ohh! This blog is great! I’ve been enjoying the archives so far and am to have a chance to win a game I’ve had my eye on! I’ve played infiltration before, it was fun! Had no idea it was a Donald x game! I’ve heard some interesting opinions on this game, would love to give it a spin! Sounds great! Hope I get picked! I’ll totally give that copy of Infiltration a loving home if picked. Thanks for the chance, duders! I would love a copy of this game! I love Dominion this looks fun! Would love to win! What a great game to give away! All the reviews of this one have been stellar. Whoever wins this game (hopefully me) is in for a treat. Keep up the good work, @iSlayTheDragon, and thanks for all your reviews! It would be great to win this game. Thanks for the contest. I love games! And I like contests. And I think the blog is pretty sweet. So I’m in. I’ve heard mixed things about Infiltration, but it looks good, and I like the Android universe Fantasy Flight is creating. I too have heard mixed reviews, but most of the average reviews I’ve seen only played the game with 3-4 people. It is significantly improved with higher numbers of players. I love Netrunner and we just recently got Android for a great price. Would be really awesome to complete the series of them. I’m a huge FF fan and have been eyeballing this game for a while. Thanks for the chance to win and a great website. Slowly getting into the whole gaming thing, and dragging my friends along with me. I’ve converted our weekly Magic night into a gaming night :-), after reading reviews on Infiltration I think this would make a perfect addition. I would love a chance to check out this game. It looks real interesting. Thanks. My gaming network never ceases to amaze me with the quality of new contacts constantly available. Glad to have been sent y’alls way! Thanks for the giveaway. Happy to be onboard!